Following the capsizing of the cruise ship Costa Concordia off the coast of Italy earlier this year questions have remained around what will be done with the wreck. The dire state of the Italian economy and the strength of the Euro has led to debates over the fate of the crippled cruise ship. With it’s owners weighing up their options; whether it makes sense financially to refloat it; to chop it into pieces to be sold for scrap; or simply sink it off the coast, given the technical difficulties involved. However 20th Century Fox has suggested an alternative with executives wanting to purchase the Concordia and surrounding land to build a European rival to the Universal Theme Park brand. Let's hope they make the right choice. Wow that actually sounds pretty clever, it may just work! the disgraced Captain can work the ticket booth! I would rather prefer the Cpt. work as the narrator, telling how he managed to "fall" into a life boat. Obviously in person of course. I would go to that park. It could really help the Italian economy. That is a neat idea, prob take a bit to make it safe though. That would be such a fun adventure! The best part would be seeing which men would disregard 'women and children first!' and barrel through a pack of little kids like an NFL linebacker just to get to that first lifeboat. That whole cruise ship story is such a mess! 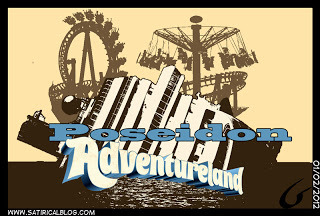 lol poseidon adventure land. That movie scared the crap out of me when I was a kid. Europe is always trying to one up us! now thats a good a idea.